If you are looking for information on the Sign-A-Rama franchise business opportunity, SignARama franchises or Sign A Rama franchising, then you have come to the right place. Every business needs signs. And there's no better way to tap into this lucrative $8 billion-plus market than with a SIGN*A*RAMA® franchise. As a franchisee, you'll be able to offer a full range of the sign-making services that businesses need with a brand name they've come to trust and respect. Just as significant, you'll get the benefit of time-tested business concepts that have worked for hundreds of other stores throughout the world. Best of all, you'll get the full support of the SIGN*A*RAMA® team - a group that is committed to providing you with the training, consulting, equipment and resources you need to make your SIGN*A*RAMA® store the sign of a successful business. with over 600 locations ... in 22 countries! Our FULL SERVICE sign centers utilize the latest in computerized sign-making technology. We sell everything from banners and vehicle lettering to neon and large outdoor electrical signs. Twenty years ago sign production companies were limited in what they could offer customers in terms of personalized work. Computers changed that. 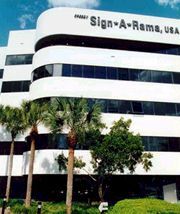 With improved technology in hardware and software, virtually any request can be swiftly fulfilled by SIGN*A*RAMA®. The SIGN*A*RAMA® Sign Center has been designed and equipped to meet the needs of our franchise owners and their clients. It begins in the neatly organized lobby and front counter area, where a customer is assisted with their purchase through the use of various samples and our own copyrighted computerized pricing system, unique in the industry. SIGN*A*RAMA® offers to the franchisee a proven concept based on business knowledge gained from over twenty years of franchising. Our practical on-the-job training is designed to be thorough and easy to follow, to assure everyone is fully comfortable throughout the program. After the two weeks of classroom instruction, your training will then continue with one of our local field representatives. They will meet you at your location, help you set up all of the equipment and continue your hands-on training right there in the store. Local Regional Offices provide continued guidance and support for all SIGN*A*RAMA® franchise owners. Training of your employees, whether it involves computer software orientation or instruction in the art of sales and marketing is something we provide at no extra cost to you. Once everything is setup and we know you're comfortable, a marketing representative comes in and shows you how to market and promote your business. So, we not only tell you how it works, we actually go out with you and show you how it works. As you need help from there on, we stand ready to help you along your way.